شورش در صحرای سینا مجموعه‌ای از اقدامات گروه‌های تندروی اسلامی در شبه جزیره سینا است که از زمان انقلاب مصر در سال ۲۰۱۱ تا کنون ادامه دارد. این ناآرامیها به خصوص پس از کودتای ارتش مصر علیه محمد مرسی به نحو قابل توجهی افزایش یافت و به حملات منظم افراد مسلح به پاسگاه‌های پلیس و پایگاه‌های نظامی تبدیل شد. ارتش مصر در سال ۲۰۱۱ برای سرکوب این ناآرامیها عملیاتی با نام عملیات عقاب را اجرا کرد که با عملیات سینا در سال ۲۰۱۲ پیگیری شد. ↑ "Al-Tarabeen tribe launches offensive against ISIS hideouts in Sinai". Sada El Balad. 27 April 2015. Retrieved 27 April 2015. ↑ "Egypt-Israel relations 'at highest level' in history". Al Jazeera. 20 November 2016. ↑ "Russia, Egypt Ink $2 Billion Weapons Deal". Washington Free Beacon. December 16, 2013. ↑ ۵٫۰ ۵٫۱ "KSA, UAE to finance Russian arms deal with Egypt". Egypt Independent. February 7, 2014. ↑ "Attack on Sinai base of Aust peacekeepers". Herald Sun. 15 September 2012. ↑ "Perpetrators of second Rafah massacre arrested". Daily News Egypt. 1 September 2013. Retrieved 9 November 2013. ↑ "Egypt sentences 14 to death for 2011 Sinai attacks". The Times of Israel. 24 September 2012. Retrieved 12 December 2013. ↑ "Jihadists attack international peacekeeper base in Egypt's Sinai - FDD's Long War Journal". longwarjournal.org. Retrieved 26 June 2017. ↑ "Deadly attacks in Sinai highlight the region's growing instability". American Enterprise Institute. 23 July 2013. Retrieved 15 January 2016. ↑ "Hassm expands armed operations from Sinai into Nile Delta". Mada Masr. 27 March 2017. ↑ "Egypt's Sinai desert: A haven for malcontents". The Economist. 13 July 2013. Retrieved 17 July 2013. ↑ "Jund al Islam claims credit for Sinai suicide car bomb attacks". The Long War Journal. 12 September 2013. Retrieved 9 October 2013. ↑ "(Allied) Popular Resistance Movement". Tahrir Institute for Middle East Policy. ↑ ۱۵٫۰ ۱۵٫۱ "Egypt army arrests head of Sinai radical militant group, dozens others". Ahram Online. 1 November 2013. Retrieved 5 November 2013. ↑ "Ansar al Sharia Egypt in the Sinai". Long War Journal. 6 July 2013. Archived from the original on 6 October 2014. ↑ "Jaysh al-Islam". Tahrir Institute for Middle East Policy. Retrieved 15 January 2016. ↑ "Al Furqan Brigades". Terrorism Research & Analysis Consortium. Retrieved 16 January 2016. ↑ "Ajnad Misr". Terrorism Research & Analysis Consortium. Retrieved 16 January 2016. ↑ "Qatar-funded terrorists' revenge from Arabs". Egypt Today. 7 July 2017. ↑ "'State of Sinai' claim attacks as part of 'IslamiYouth Uprising'". Daily News Egypt. 29 November 2014. Retrieved 8 December 2014. ↑ Bill Roggio, Mujahideen Shura Council denies involvement in Sinai assault, Long War Journal (بنیاد دفاع از دمکراسی‌ها) 6 August 2012 Archived 15 August 2014 at the Wayback Machine. ↑ "Al-Jihadeya Al-Salafeya leader Al-Zawahiri captured". Daily News Egypt. 17 August 2013. Retrieved 22 August 2013. ↑ "2 militants killed in North Sinai". Ahram Online. 31 August 2014. Retrieved 8 September 2014. ↑ ۲۶٫۰ ۲۶٫۱ "Egypt army kills 15 militants in Sinai". Xinhua. 9 October 2014. Retrieved 9 October 2014. ↑ "Islamic State's Egypt affiliate urges attacks on judges - recording". Reuters UK. Retrieved 3 October 2015. ↑ "Egypt army says it killed Sinai-based leading militant - statement". Aswat Mariya. 1 August 2015. Retrieved 1 August 2015. ↑ "Egypt says top militant killed". Arab News. 2 August 2015. Retrieved 2 August 2015. ↑ "Sisi: Egyptians chose 'the difficult path'". 10 January 2017. ↑ "Sinai, Egypt's unsolved problem". Ahram Online. 18 July 2013. Retrieved 18 July 2013. ↑ "Egypt: ISIS attack kills 15 security personnel in north Sinai". Retrieved 20 March 2016. ↑ Worth, Robert F. (2016). A Rage for Order: The Middle East in Turmoil, from Tahrir Square to ISIS. Pan Macmillan. p. 226. Retrieved 31 July 2016. 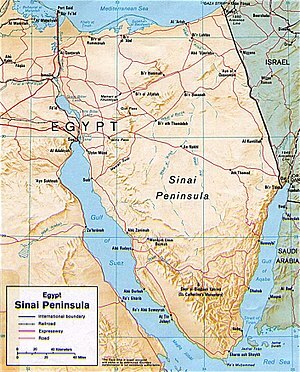 The insurgency in Egypt's Sinai Peninsula was growing fiercer. At least two thousand soldiers and police had been killed in the preceding two year [up to the Summer of 2015]. ↑ "13 Egypt policemen killed in Sinai attack claimed by IS". middleeasteye.net. Retrieved 26 June 2017. ↑ "Soldiers, militants killed in clashes in Egypt's Sinai - France 24". france24.com. 19 July 2015. Retrieved 26 June 2017. ↑ "Egypt military says two soldiers, 64 militants killed in Sinai". alarabiya.net. Retrieved 26 June 2017. این صفحه آخرین‌بار در ‏۱۴ اوت ۲۰۱۸ ساعت ‏۰۱:۳۴ ویرایش شده‌است.